Searching through the wide array of exterior finishes for the one that offers the most protection, is esthetically pleasing, and has the cheapest maintenance schedule is not simple. The reasons are that there are many tradeoffs and that manufacturer's claims often tend to obscure facts from consumers. Still, everyone believes that you have to protect wood. But, from what? This part (Part I) of the article discusses what happens to wood and finishes left outside. Part II follows with information on finishes and maintenance, based on what is presented here. As humidity levels change, wood responds by releasing or absorbing water vapor, until the internal moisture content of the wood is in equilibrium with the ambient humidity. As wood absorbs water vapor it expands. It contracts with loss of water vapor. This is the cause of a lot of problems for wooden construction, either indoors or outdoors. Generally, things are worse outdoors in terms of expansion/contraction issues. The real issue is that wood does not behave nicely. It expands and contracts more in some directions than in others. 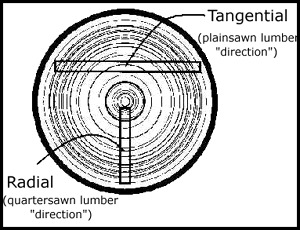 Figure 1 shows two lumber cuts: radial and tangential. The amount of expansion in the R direction can be as small as half the amount of expansion in the T direction. In fact, by dividing T/R you get a quotient that relates to how dimensionally stable a particular species is. The lower the number the better, especially for furniture construction. Wood expands and contracts very, very little in the direction of the grain (longitudinally), perhaps 1/20th as much as is seen in the other two directions. As a side note, all this means that quartersawn lumber will move less across its width than plainsawn lumber does. For very wide pieces of solid wood (for example tabletops) quartersawn lumber shows much less movement. It may be a better choice for applications like a tabletop with breadboard ends. Lack of movement in the longitudinal direction is why breadboard ends require special joinery, by the way. Checks occur near the open endgrain of lumber. This is because endgrain gains and loses moisture vapor much faster than side grain. The huge moisture gradient from the dry open end towards the moist inside of the board creates a strong force that causes the cells to part along the grain direction. Liquid water also moves into and endgrain faster than side grain. This is why the ends of boards tend to rot sooner than other areas. See Rot below. Because lumber moves the way it does, it creates undue forces on some surfaces when seasonal humidity changes occur or when parts of the board are at very dissimilar internal MC values. These forces show up as warp. Warp is often initiated by differences in moisture from one side of a board to the other. For example, if you lay a board on moist ground, out in full sun, for several days, you will get some interesting warping. The sun creates one very dry side, the ground one very moist side. This same effect may happen when you attach clapboard to the side of a house with no vapor barrier. The sun bakes one side, moist air from the inside of the house works on the other. Warped siding is the result. Logs, columns, and larger dimensional lumber usually crack radially as they dry. Very thick pieces of lumber take years to come to MC equilibrium with their environment. Because radial shrinkage cannot keep up with tangential shrinkage, a crack occurs where excessive tangential forces pull apart wood fibers. Cracks form from the center to the outside. Smaller pieces of stock and kiln-dried wood do not usually have this problem. 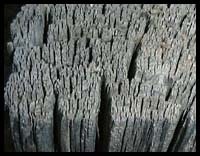 It is often not practical to kiln dry massive timbers, so they commonly exhibit radial cracks. This picture shows cottonwood with radial cracks. Figure 3 also shows radial cracking in the T plane of the post. The quartersawn side of wood never exhibits these cracks, which may be another plus for the use of quartersawn lumber. Cupping is slightly different from warping and cracking because it doesn't have a lot to do with the T/R expansion. Instead, what happens is that the upper surface of the board becomes gorged with water when it rains. All of the wood fibers on the surface become inflated. The fibers run out of room and smash their neighbors. When the sun comes out and bakes the surface bone dry, the fibers all shrink back, but because a lot of fibers are now smaller, the surface shrinks back to a smaller size, bending the board into a cup. It bends because the other side of the board still has larger, uncompressed fibers. The technical term for this process is compression set. Rot occurs only when the internal MC of wood gets above about 20%. Microorganisms degrade the connections between wood fibers, and the wood becomes spongy. Some species are much more prone to rot. Pine and maple are near the top of the love-to-rot list. Species like Teak and Western Cedar are slow to rot because they have anti-microbial compounds in them that inhibit the growth of microorganisms, even when the wood has a lot of moisture. Choosing the right species for outdoor applications may mean that no finish is required, except for esthetics. Some finishes retard liquid water from moving into wood, and are good choices on rot-prone species. Chemical pre-treatment of wood is the best means of stopping rot organisms. Endgrain, because it slurps up water the fastest of all surfaces, is the most likely area for rot to start. Any wood that is immersed in water for long periods of time or frequently covered with mist is a first class candidate for rot. Dry rot is merely a rotted area of the wood where fibers have dried out. No rotting whatsoever can occur in the absence of moisture. The rotting has to have occurred at some earlier time when the wood was wetter. Most insects attack wood largely to create living space or lay eggs. However, termites eat wood fiber and digest it. There are lots of species of insects that cause problems. It should also be obvious that outdoor wood is a sitting duck for insect infestation. Only pre-treatment of wood with special toxic chemicals is really effective long-term in preventing insect attack. Most conventional finishes do not provide long-term insect protection. Some species of wood are not at all prone to insect attack. Eastern Red Cedar is a shining example. It even repels insects, and is used to line closets and chests. It provides moth-proofing. Ultraviolet light breaks down lignin. Lignin holds wood fibers together. As the lignin breaks down, rain washes away the degraded lignin along with 'unglued' wood fibers. Very slowly, the exterior of the wood becomes degraded. A year of exposure may remove less than 0.5mm of wood surface. The picture at left shows severe erosion of Ponderosa pine endgrain with fifty years of exposure. Also note the radial cracking on the planesawn side only. The insidiously bad part about UV erosion is that short-term exposure on raw wood seriously reduces the ability of any finish to adhere to the wood. This results in premature finish failure. If you have left raw wood exposed outside for more than a few days, consider sanding off the outermost layer of UV-degraded surface before you apply any finish. UV exposure is the main culprit for the start of finish failure. Finishes are made of complex polymers- big molecules. These polymers hold the finish together and keep it stuck onto wood. Photooxidative processes initiated by UV exposure chemically break down the big molecules. Molecules that are damaged can no longer keep the finish film held together in a single barrier. The finish fails. It fails because the film loses flexibility and cracks. Even a tiny crack is fatal. Since ultraviolet light breaks down any binder material, it's easiest to see this process at work in latex paint chalking. Paint is applied and later develops a layer of a chalky substance. This chalky stuff is a mixture of degraded binder and the pigment that was held in the film by the binder. Similarly, clear films (which are only binder, no pigment) often become opaque as UV damage ensues, and then begin to flake away. The death knell for most finishes comes from any break in the finish. It is the chink in the armor. Very few finishes ever last long enough to be eroded away completely by UV exposure. They usually are torn into pieces by water long before that point. Any size break is fatal. Once the finish has any openings, water immediately attacks the finish and begins to lift it off the wood. Water is the cause of the peeling and cracking that you see. If the substrate becomes damaged or has a high MC, then water will attack and lift off the finish from underneath. Blistering is usually caused by water from inside the board migrating to the surface and lifting the flexible finish off the wood. Applying finish to wet wood results in blisters, as does water vapor moving from inside an old house without a vapor barrier, out through clapboard siding and into blisters. Delaminated plywood or insect damage also provides water a path to attack the finish. As wood expands and contracts, the finish has to expand and contract also. If it can't stretch with the wood, the finish cracks. It has failed. 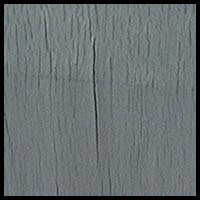 If moisture is moving from one side of a board to the other, as in the clapboard example above, the finish film will develop blisters and fail as the blistered film breaks. Long oil (spar varnishes) permit extra flexibility. Interior (short oil) varnishes are more brittle and fail when the wood expands and contracts too much. Exterior varnish also has UV inhibitors. This is one example of formulation changes needed for indoor vs. outdoor applications. And is an example of the reason why you should not use interior finishes for exterior applications. Dings from storm damage, or abrasion from foot traffic on finished floors are examples of other types physical damage that create an avenue for film degradation. A special consideration is film adhesion to earlywood and latewood. Adhesion to earlywood is often stronger than to latewood. So, the expansion and contraction of the wood often may cause the film to 'shake loose' over latewood. When this happens, the grain pattern shows as raw wood, and the other areas still have a finish on them. Some species, like Douglas fir, have pronounced, dense latewood and are more prone to having finish films fall off in those areas, compromising the finish. Plywood with rotary cut veneer requires a special comment. Exterior plywood does not last well if left unfinished outdoors. It needs a finish. The reason is that it has facechecks in the surface veneer, priming it for early failure. It will not last at all well unfinished because the microscopic cuts provide water an entry point. Also, do not use waterbase latex paint on exterior rotary cut plywood; other types of oil-based paint fare better. Latex will not stop water from going in the facechecks. Using latex over an oil-base primer also works better. The picture at left shows film failure and veneers lifting from facechecks. Part II discusses specific finish schedules for exterior applications. Click to continue.